The group leave Rhyl, describing the town as a ‘a favourite place for pleasure seekers’, they eventually arrive at Prestatyn, having taken the wrong road, and ending up miles out of their way. 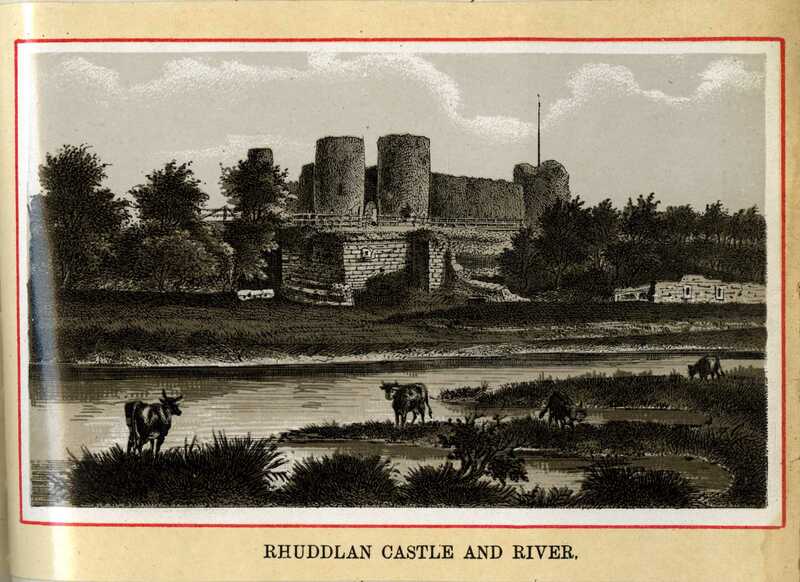 They pass Rhuddlan Castle, Point of Ayr, Mostyn, Greenfield, Holywell arriving at the Cross Foxes in Flint at 12.30. Another wet morning as we bid good bye to Rhyl, this place early in the present century, was a small fishing hamlet. It is now a favourite place for pleasure seekers, the air is pure and the sands very fine. An Iron Pier 700 yards long, forms an agreeable promenade. At 20 to 10 “Tommy” is again ready and we drive a round about way through country lanes and fields evidently on the wrong road, we see an old rustic bridge by the hills to our right, then drive past a lead mine and some gipsies. Eventually we come out at Prestatyn where we had been previously I know not, we had evidently “gone wrong” and many miles out of our way. In the direction of Rhuddlan where there is an old castle, we passed on our left some very pretty but very low cottages, one story high, we pass on through a lane, skirting a wood, where we see the keeper, keeping a close watch on a lot of your pheasants in the distance. We see the light house and Point of Ayr, pass on through a place called Ffynnongroew and Linegar post office on to Mostyn. We pass a lead works on our left where there is a fine water wheel, then on through Greenfield, leaving Holywell a little while on through the long dirty looking village of Bagillt to Flint, where we arrive at 12.30, the last few miles have been through the most dirty looking and miserable part of our journey. We put up at the Cross Foxes atFlint, in the stable yard we were fortunate in “finding” a bakers tray full of hot Eccles cake. After parting with a little more of the family plate, Ellis became the possessor of some portion which we enjoyed. The men proceed towards Rhyl, and arrive just before the ladies. They stay at Min y Don Cottage, and have tea. They spend time on the promenade, listening to a ventriloquist, and spend the evening at the Theatre watching ‘Diplomacy’. 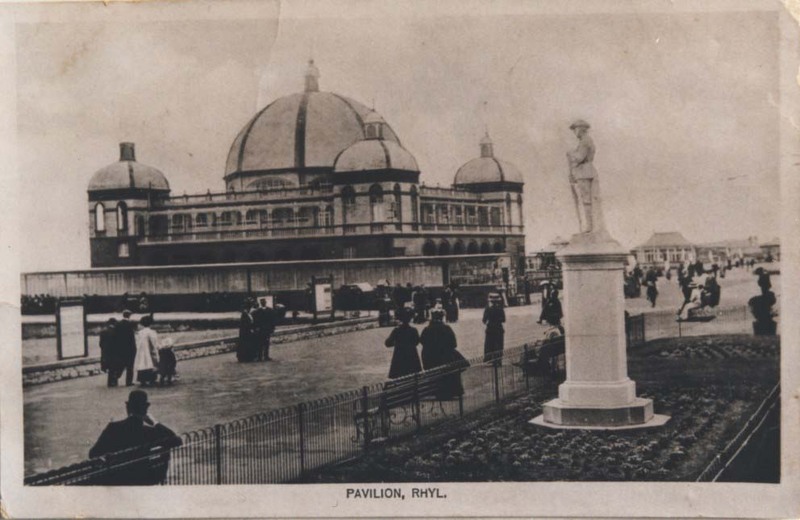 DD/DM/1422/9 – Pavillion and Soldier’s monument, Rhyl c1920, from our collections. 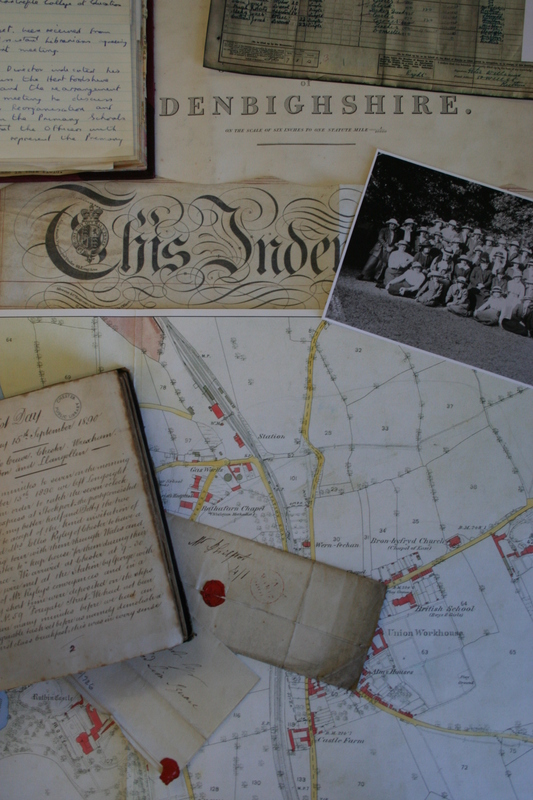 Available to view at Denbighshire Archives. For some miles before arriving at Rhyl, the roads being low and the railway intervening between the road and the shore, we loose sight of the water, so we were disappointed not seeing the “Cambria” on our way. We drive on to the meeting place, Mrs Davies, Min y Don Cottage, an old cottage on the promenade, but find we have arrived here first, we don’t wait long before the kettle boilers turn up, each one having the “cramp” on the face for having seen us drive on before them, they are in wonderment as to who our fellow passengers are, when Uncle Arthur’s face is seen with his friend the “cramp” disappears. As the time is very limited before the boat goes, and as Arthur returns by it, he leaves us to “do our own” pro-tem. At 3 o’clock we put Tommy up at the White Lion Hotel Stable and adjourn to Min y Don for tea. We spend a pleasant hour or so on the promenade listening to the singing. Going down the lane we listen to a professor lecturing on noses and whilst the ladies went to get supper (there by hangs a tale) we listen to a ventriloquist with Tommy and Joey not forgetting “Ginger” etc etc. Eventually we get to the Theatre on the pier to see “Diplomacy”, the acting was very good, but the stage miserably small. We were somewhat amused by one of the audience desiring to sing between the acts, his wife had difficulty in restraining him, the only sound we heard was “y’er, y’er, y, y, y’er, y’er” at last he shouted “I must sing or burst” eventually he was persuaded not to sing whether he burst or not, I can not say. We skidallied off the pier and away to bed.